The Plixer team recently had the opportunity to attend the 2016 EDUCAUSE Annual Conference in Anaheim, California. Over the course of the show we got to meet with many security, network and executive teams. We listened as they shared with us the problems they are facing every day. Networking teams need efficient and timely ways to monitor the performance and saturation of their resources. Executive teams need reports to help them plan and manage the networking infrastructure. Security teams need to protect assets with the least user restriction possible. As a former educator and technology integrationist this issue resonates with me. There are so many demands on the educational IT professional and they are often working with limited resources and budgetary restraints. 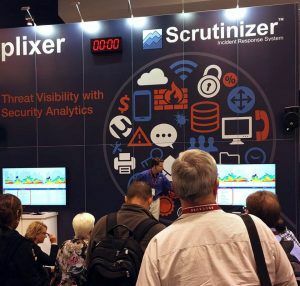 Our industry-leading security analytics and incident response system called Scrutinizer helps to provide efficient cybersecurity and threat visibility management for schools and universities, making the most of the resources available to you. Information Security ranks number one in the Educause Top 10 IT issues of 2016. Professionals in the field are looking to “develop a holistic, agile approach to information security to create a secure network, develop security policies, and reduce institutional exposure to information security threats.” The networks on an educational campus face unique problems when it comes to information security. They are tasked to balance the freedom of access with the protection of important data and digital assets. According to the Symantec 2016 Internet Security Threat Report the education service sub-sector is rated third in the top targets of data breach incidents. These networks are enticing targets because they hold personal information such as Social Security numbers and medical records, and intellectual property and research data. Ensuring that members of the institutional community (students, faculty, and staff) receive information security education and training. Developing an effective information security strategy that responds to institutional organization and culture and that elevates information security concerns to institutional leadership. Planning for and implementing next-generation security technologies to respond to evolving threats. It is so important to keep our schools connected to the outside world. As malicious activity grows and becomes more sophisticated, it becomes even more important to have a detection and response plan in place. Stay tuned to get an inside look into some easy and efficient steps you can take to keep your campus information safe. Jennifer is a Software Engineer at Plixer. She strives to create a product that provides customers the optimal experience. Jennifer loves working with data visualizations and finding new ways to make that information easier to understand. When she’s not working she enjoys spending time with her children, video games, dancing and theater.